The ELCA Malaria Campaign reached its financial goal of raising $15 million. Thank you! Working with our Lutheran companions and partners in 13 African countries, we have brought about lasting change. As of Jan. 31, 2016, the ELCA Malaria Campaign has concluded. Although the fundraising campaign has come to an end, our commitment to ending deaths from this preventable, treatable disease has not. 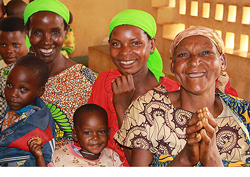 Support to our companions and partners to address malaria will come through gifts to ELCA World Hunger, which has a long history of supporting health-related work. Questions? Download this FAQ sheet or email hunger@elca.org. © Copyright Evangelical Lutheran Church in America.